About fifty black & white photographs were donated, date unknown, to the Town of Hot Sulphur Springs by Paul F GIlbert (1915-2008) and are displayed in the Town Hall at 513 Aspen Street. In 2012, the Town Clerk and Town Webmaster decided to scan all the images in order to preserve and protect them that they may be viewed, studied and appreciated by local residents, historians and others for all time. Many if not most of these photographs were taken by photographers other than Gilbert who was born in 1915, after the date of some photographs. Many of these photograph negatives and glass plates are owned by the Grand County Historical Association (GCHA). Please contact GCHA if you would like to purchase copies of any of these images. Otherwise copying of these images is not allowed without express permission. All photographs were scanned as TIF files at 1200 DPI in color in order to pick up subtle tones in parts of the monochrome image using a Brother LED digital scanner. No corrections or compressions were done while scanning. Some cropping and minimal correction was done after the initial scan. After completion of this project, digital files of these photos were then stored at the Town Hall office and in offsite professional storage 'cloud' facilities. Photographs were then reframed with new paper dust covers and replaced on the Town Hall walls. Although the files were scanned at a high resolution, the photos on the following pages are of a much lower resolution in order to discourage commercial use and to allow these pages to load at a faster rate. Note: All of the photographic images have imbeded links to individual images that open in a separate browser window. Please click on the photograph itself for a standalone image. Use Control + (PC) or Command + (Mac) keys to enlarge (zoom) the individual expanded images further. The Town of Hot Sulphur Springs is very grateful to have these images that depict our history and many of our early settlers. Enjoy. 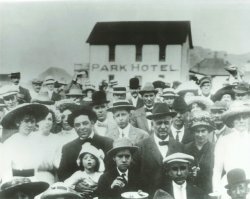 Links to the three pages of photographs are under the History page link at the top of the page and in the Phase 1, 2 and 3 links in the column to the left. For a PDF file copy of the five page inventory of the fifty-three photos in this collection, please click here. 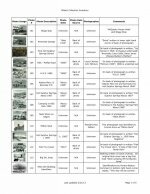 This document lists all the information available on the back of the photographs including photo title, date of photograph, photographer and other information, when available.